Explosions boomed from Guatemala’s fearsome Fuego volcano Wednesday, unleashing fresh torrents of molten mud and ash down slopes where officials said 75 people had been killed and 200 were still missing. According to Press TV, fears of a new blowup of the 3,763-meter (12,346-foot) volcano have stalked rescue workers since Sunday’s eruption buried entire villages on its southern flank. Officials said the known number of dead from that eruption was 75, though the toll was expected to rise. 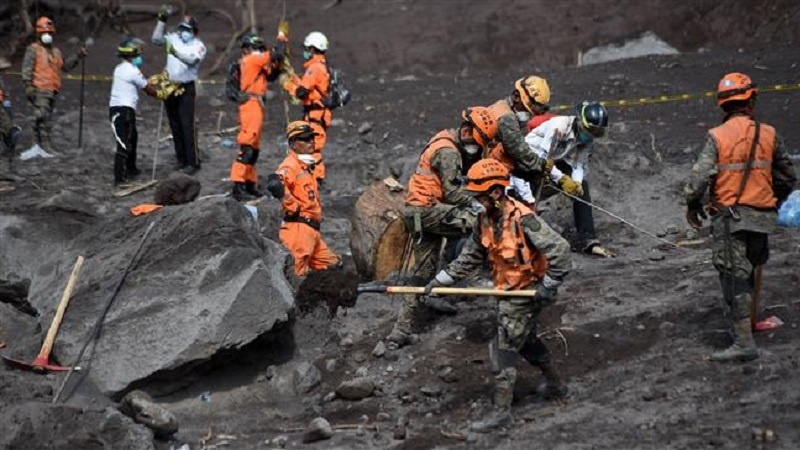 “We already have data with names and locations where there are missing persons and that number is 192,” Sergio Cabanas, Head of Guatemala’s Disaster Management Agency, told reporters. Among the latest of the 75 fatalities reported by the National Institute of Forensic Sciences was a 42-year-old woman who died in hospital, having lost both legs and an arm in the eruption. Hundreds of rescue workers, including firefighters, police and the military, were battling adverse conditions to search for remains in the tangled morass of rubble, dust and earth left behind by the landslides.